Nicholas S. Hirst brings financial industry expertise to sophisticated commercial and securities litigations and enforcement matters. Nick has significant experience representing investment advisors, broker-dealers and financial industry professionals in both FINRA and SEC enforcement actions. Nick employs technical expertise through every phase of regulatory examinations and investigations: coordinating discovery and responding to subpoenas, defending depositions, drafting Wells submissions, and negotiating proposed charges with enforcement staff. Nick has also advocated on behalf of a client who successfully sought an award from the SEC’s Office of the Whistleblower under the expanded whistleblower provisions of the Dodd-Frank Act. As a litigator, Nick’s practice encompasses complex commercial and securities matters in federal and state courts as well as before arbitral bodies. 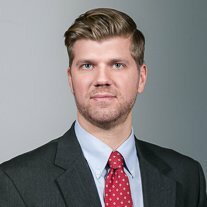 He has represented public corporations, private investment funds, real estate developers, and individuals in a wide variety of disputes, including shareholder class actions; claims arising under the Securities and Exchange Act; and claims of fraud, breach of fiduciary duty, and breach of contract. Nick has also handled leasing, employment, and other corporate matters for restaurant industry clients. In Delaware Chancery Court post-merger shareholder litigation, representing an activist hedge fund alleged to have aided and abetted the fiduciary breach of target corporation in connection with fund’s successful proxy campaign. Negotiated successful resolution of multi-million dollar trading dispute over corporate bonds involving allegations of back-office irregularities; handled related FINRA inquiry. Nick graduated in 2012 from the University of Michigan Law School, where he was an Articles Editor for the University of Michigan Journal of Law Reform, represented political asylum seekers in Michigan’s clinical program, and served as a research assistant and supervisor for the Michigan Environmental Crimes Project. Nick is a St. Louis native, and during law school was a judicial intern for the Honorable David D. Noce, Magistrate Judge for the United States District Court for the Eastern District of Missouri. He received his Bachelor of Arts in Economics and History from Washington University in St. Louis in 2007, and is a lifelong Cardinals fan.